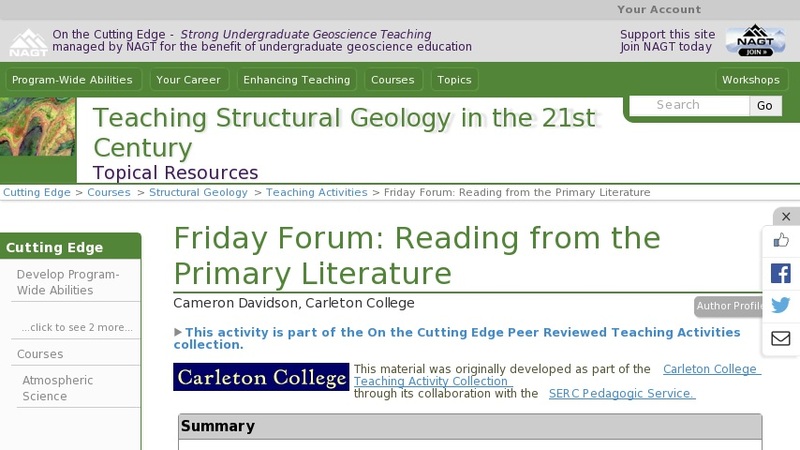 Friday forum is an integral part of my course. I choose papers before the term begins based on my own interest, the interests of my students (e.g. senior thesis topics), and the types of projects we plan to complete in the course that term (e.g. term-long or multi-week research problem ). The number of papers is based on enrollment so that two students are responsible for one paper. I integrate the papers into my syllabus so the students know when each paper must be read and discussed. At the beginning of the term, I have the students rank order their choice of paper. Their decision is typically based on interest and timing with respect to the term. I then assign them a paper based on their ranking. This works well in that they typically get their first or second choice , and the students feel like they have a say in what they are going to present. At the beginning of the term I hand out the first paper we are going to read. Everyone in the course reads the paper, and must submit three questions about the paper to me via e-mail by 4:00 PM the day before we discuss the paper. After the deadline, I compile the questions, identified by name, and send to everyone in the course as soon as possible. This typically ensures that the students read the paper, and that we have plenty of ammunition for the discussion. On the day of Friday forum (typically Friday), the two students responsible for the paper give a 10-15 minute presentation on the paper emphasizing the main point(s) of the paper, along with any background information they think is necessary to fully understand the paper. Sometime before their presentation (usually the day before), I schedule a one-hour meeting with the presenters to give them the chance to ask me any questions they have before putting together their presentation. I believe this is an essential part of the process in order to clear up any fundamental questions. After the presentation, we sit around one large table (four lab tables put together) for the discussion. I think the round table format, with everyone facing each other, helps promote discussion. Its up to the student presenters how they want to lead the discussion, but typically they focus on themes that emerged from the question s submitted by the rest of the students. This has the added benefit of drawing the rest of the class into the discussion. The hardest part for me to control as an instructor is to try and keep my mouth shut, and allow the students to explore ideas on their own.